The dinosaurs in the lower part of the formation differ from those in the upper part. These two dinosaur assemblages, characterized by distinct dinosaurs, show the replacement of older, European-like dinosaurs with younger, Asian-like dinosaurs during the last half of the Early Cretaceous. Three faunal zones have been proposed. One is the Acrocanthosaurus Astrodon Zone with fauna descended from the Late Jurassic fauna contained with broken forests and open prarries that existed along the Gulf Coast to Maryland. Polcanthines are rare members of the preceding Late Jurassic fauna. They survive and are moderately diverse in the Early Cretaceous. They show a connection existed to the European faunas. The oldest western North American is Sauropelta, from the Cloverly Formation, there are some scrappy fossils from Eastern North American that are older. Utahraptor was found about the same time Jurassic Park was released. It is actually a much better fit for the movie raptor than the actual turkey sized Velociraptor. This was a large animal around 21 feet long the largest known official dromaeosaurid. Oddly raptors get smaller over time and by the Late Cretaceous most are relatively small animals. Fossils have been found associated with the sauropod Astrodon and the armored dinosaur Gastonia They may have been prey although Iguanodon seems like an easier meal. 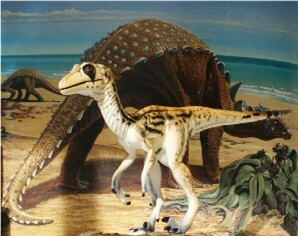 Utahraptor coexisted with the coyote-sized dromaeosaur Yurgovuchia doellingi near what’s now Arches National Park. Gastonia was the largest and best known polacanthine ankylosaurid closely related to Polacanthus and Hoplitosaurus. Sauropelta had bands of large and small shields across its back, and may have also have had spines sticking out from its sides. It was one of the largest nodosaurids at 26 feet long weighing 2 -3 tones making it one of the larger nodosaurids. Sauropelta was more lightly armoured than latter ankylosaurids and nodosaurids. The spikes were made up of thin, compact bone with less reinforcing collagen than in the heavily armoured nodosaurids. The relative fragility of the armour suggests display as much as defense. The skull was long and narrow with a flate roof and tapering snoute.